I did this fanart for Fire Emblem Compendium a fan proyect I was lucky to get into. Fire Emblem is one of my favourite games, and Sue is the daughter of my favourite character of all time Rath (who I ship with Lyn so badly), sorry Laslow. For this illustration I was inspired by some of her support conversations. That quote of Dayan: ‘You must listen more carefully to the voice of Father Sky and Mother Earth. We humans are but tiny creatures compared to the size of the great Sky and Earth.’ and the conversation with Fae about going to a place with lots of pretty flowers. So I decided painting her happily riding through the plains finally at home after the war. 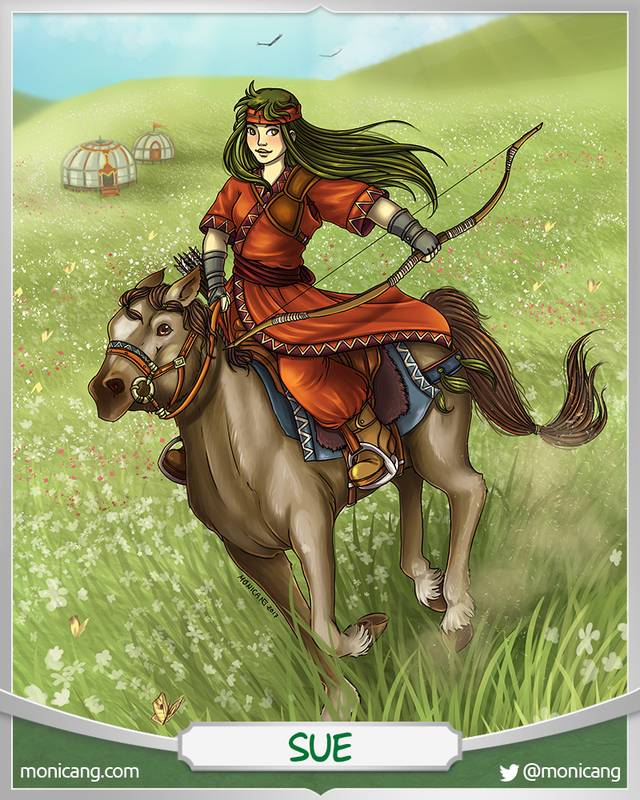 Since I first played with her father and Lyn, I’m a big fan of nomadic cultures. So I mixed the artwork of the game with researched Mongolian details to add more depth to the illustration.